It’s rare for a 16-year-old to compete in what is considered the “Super Bowl” of a sport, but that is what resident Gunnar Stanton recently did. 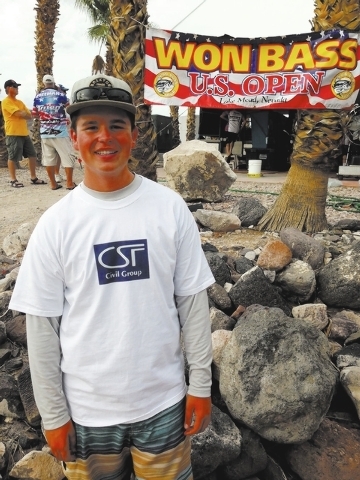 The Boulder City High junior was on one of the nearly 140 boats that competed in the Western Outdoor News U.S. Open bass tournament Sept. 9-11 at Callville Bay on Lake Mead. The pro-am event drew fishermen from as far away as Japan and Australia. The competition paired professional bass anglers in two-man teams with amateurs. While Stanton had to take the three days off from school, most of the amateurs had to take time off from jobs. Stanton’s $600 entry fee was paid by local businesses CFS Civil Group, Charger Construction and Characters Unlimited. The pros paid $1,600 entry fee. Stanton, who has lived in Boulder City his entire life, had to defer to the pro the first day on where to drop lures, even though he has more experience fishing the lake. But Stanton eventually convinced his pro partner to let the native pick the spot. Each day was approximately eight hours on the lake with start times around 6 a.m. This is the second year Stanton has competed in the event; he finished 40th last year. He started tournament fishing last year, and won the Nevada State Junior bass tournament in July in the ages 15 to 18 division. The victory entered him in the Western Regional Junior bass tournament, which will run in Montana in May. The WONBass U.S. Open, the richest bass fishing event in the West, had 284 professionals and amateurs competing. The pros competed for an $80,000 first prize, which included a $40,000 new Nitro Z-8 bass boat with a 225 horsepower Mercury Pro XS. The WONBass U.S. Open isn’t part of any fishing circuit. The nation’s top professional bass fishermen compete at two top levels — the Bassmaster Elite Series and the newer FLW Tour. Stanton’s goal is to be a professional bass fisherman. In the United States, about 150 to 200 bass fishermen can make a living exclusively from competing at the tournaments, according to the Las Vegas Review-Journal. The top three or four earners in professional bass fishing generate $750,000 to $1 million annually, with the next 10 or 15 moneymakers earning in the $200,000 to $500,000 range. After three days of fishing, 1.39 pounds separated the top three finishers in the pro division, with the top prize money and the boat going for a total bag weight of 31.44 pounds, with the big fish weighing 3.23 pounds. The highest amateur finished with a 31.11-pound bag, which was more than the second-place pro. However, the top amateur took home $5,500, $11,500 less than the No. 2 pro’s prize money. Stanton said his biggest fish was 2½ pound largemouth bass. Stanton said there is more to competitive fishing than just throwing your line in the water and hoping for the best. “You have to figure out what the fish are eating so you can match the bait with that,” he said. The competitors also have to follow weather patterns, and figure out where the fish are likeliest to be in the lake. Stanton said the largest fish he’s ever reeled in was an 80-pound halibut in Alaska when he was 9. The largest fish he’s caught on Lake Mead was a 6½-pound large-mouth bass a few years ago. Editor Arnold M. Knightly can be reached at aknightly@reviewjournal.com. Follow on Twitter: @BCReview. The Las Vegas Review-Journal contributed to this article.